Every day at CAPE, we push vehicles, restraints, and equipment to their breaking point. We’re tough on them, to make them safer for you. 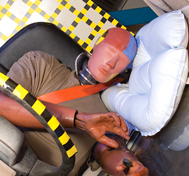 With specialized instrumentation, high-speed video and CAPE expertise, customers can evaluate airbag deployment and pyrotechnic devices in our laboratory.